"To fast-track infrastructure development, we should also consider dovetailing our regional programmes and plans with continental ones, in particular the AU Action Plan for Accelerated Industrial Development of Africa and Agenda 2063," Geingob added. 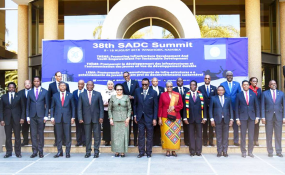 The president believes that SADC's renewed focus on industrialisation, especially through beneficiation and value addition, will enhance the region's competitiveness, create opportunities for young men and women to participate fully in the exploitation of the region's natural resources, as well as enabling young people to be architects of their own socio-economic development. "We all have to be cognizant of the fact that to unleash the enormous potential of our youth and harness the demographic dividend, we must create, within our economies, the necessary opportunities for social and economic transformation," Geingob added.